I wish all the mothers, and women who are just like mothers (aunts, cousins, friends, mother-in-laws, to name a few), a very, happy day! May you be recognized for all of the love you send out into the world today, and every day. I’d like to share a poem and artwork I created in honor of a very special mother, my sister. She is a mother to three beautiful and loving children. I look up to her. Once I became a mom, I looked to her for advice. 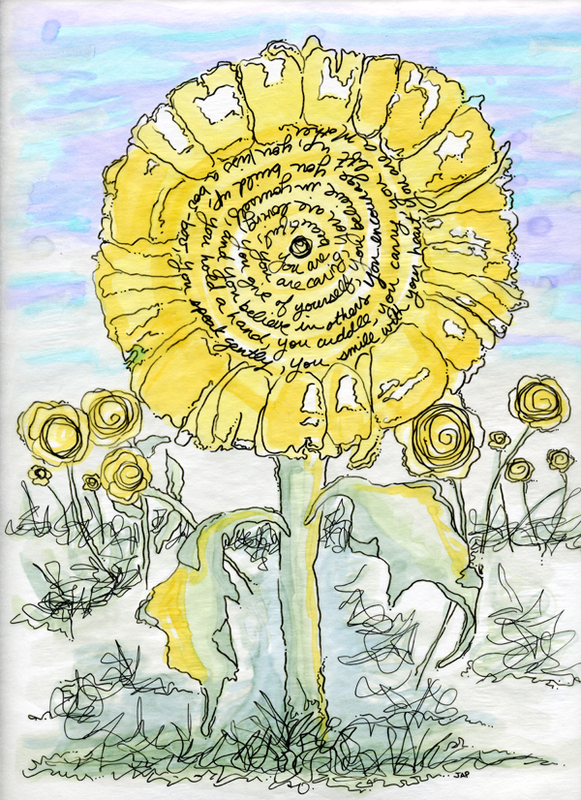 If you look closely, you will see the poem incorporated into the artwork as the center of the flower. Not only is this poem for my sister, it is also dedicated to all of the moms and ‘just-like-moms’ out there, too! You give of yourself, You believe in yourself, and you believe in others. You cuddle, You carry, You lift up, You kiss a boo-boo. You speak gently; You smile with your heart. This entry was posted in Vellum, art markers and india ink and tagged art heart colorful helping hands yellow green expressive lines, art markers, colorful, flower, india ink, mothers, poem, vellum. Bookmark the permalink.